There is something different every evening, be sure to check your schedule to know what is happening. After dinner, we have child-friendly fun. 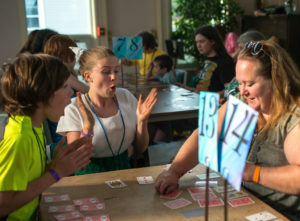 The Young Adults host Monte Carlo night which is a fun night of silly outdoor games. Peek is a game for all ages that is part cards, part dice and feels a little like Bingo. Everyone is a winner. There might be a euchre tournament, a contra dance [link to post] or a hymn sing [link to post]. One night there is a community dance and ice cream social. At the end of the week, there is a Children’s talent show. Evening vespers is 8 – 9:15 pm. You can enjoy vespers while your child is supervised at children’s vespers [older children] or at evening playground [younger children]. After Vespers is the curfew for those 8 and under unless they are in the care of their parent or guardian. Families which are housed near each other in the dorms and can informally arrange to share evening child care. Once the kids are settled, you might have a chance to slip away. You will have to choose between the pub [insert link – see below] and whatever is scheduled that evening. It could be a concert, poetry open mike night, or the youth talent show. All week long, musicians have been rehearsing their small ensembles that are performed on Friday. And if that is not enough choices, the Oberlin Summer Theater Festival offers free performances a block away. The Youth and Young Adults hold their own vespers later in the evening.